On behalf of Transition Meaford, we are inviting you to share your vision of a resilient Meaford community as we renew ourselves in 2019. Building resilience can mean many things to many people, including economic, social support, environmental, active engagement, connected, and healthy livelihoods. How would you like to build a resilient Meaford community? Click here to fill out the quick form or send us your thoughts simply by emailing transitionmeaford@gmail.com. We are going to get-together in the second week of March 2019 to chat how we may support our collective vision. So please complete this survey as soon as possible so your input can be counted. Your input will help identify our community’s various assets, interests, and needs, and foster a spirit of building mutual generosity toward building a healthy and resilient community. Please share this survey with others who you think may be interested in participating. We have a web site which Leo kindly administers for us for free, and we see the value of using the web site as the community connector. We need your participation to ensure the web site is a social and actively updated space. We look forward to your sharing of feedback, ideas, events, and discussion online. Once again the Municipality of Meaford, in conjunction with a group of volunteers, will be hosting various events around the Municipality during Earth Week. This year the RE-Use & ECO-Fair will take place at the Meaford & St Vincent Community Centre on Saturday, April 29th from 10am to 2pm. The Fair provides a very practical venue for promoting re-use & recycling─ A positive, up-beat way to support Moving Towards Zero Waste efforts in our community. Spring cleaning and donating reusable items; the perfect partnership. The RE-Use portion of the RE-Use & ECO-Fair is one key way the community contributes to waste reduction. The RE-Use station receives unwanted but reusable goods. The goods then are passed along to groups that request them in advance via their Wish list. Over the past 3 year’s almost three tons of goods changed hands. If you are a member of a community group that would like to participate, please complete the Wishlist Application 2017 and return it to aknott@meaford.ca by Friday, March 31st. The list of items needed will be published in April, so please check back then! What Is A Wishlist & How Is It Connected To The RE-Use & ECO-Fair? The Wishlist Form is the vehicle where by groups, churches, schools and budding entrepreneurs request needed, reusable items for their organization. There is no cost attached to submitting a Wishlist Form on behalf of your group. There is always a deadline for receipt of the completed Wishlist Form. Time is needed for public advertising of the Master Wishlist before the day of the RE-Use & ECO-Fair. The published Master Wishlist does not have the names of the groups on it. The RE-Use & ECO-Fair is where the exchange of stuff happens. The donated items that are dropped off are sorted and boxed by volunteers for the groups requesting the useable stuff. Why is the Wishlist event connected specifically to the RE-Use & ECO-Fair? At the ECO portion of the Re-Use and Eco Fair, the municipality would like to feature local earth-friendly vendors who’s business upcycles or repurposes items from one once useful life into another, or has other eco-friendly practices. It is a great way to showcase your business and reach out to other eco-minded residents who are working towards a cleaner environment. There is a $10 application fee to hold your spot for the Fair. Reserve your space as soon as possible. The application deadline is April 3, 2017. Space will be allocated on a first come, first serve basis. For more information on the Re-Use and Eco Fair, contact us at 519-538-1060 ext 1200, or email aknott@meaford.ca. We are Friends of Waste Reduction (FOWR), a volunteer group connected with the Development & Environmental Services Department of the Municipality of Meaford. To create, test and implement inspiring & practical initiatives that support waste redirection & reduction; initiatives that may be voluntarily embraced by local groups, event organizers, churches & businesses. We are a non-political, non-confrontational grass-roots team, focused on the benefits of taking action to help turn our waste stream into a resource stream. Everyone is welcome to join in & support our aims. This is a journey of working towards zero waste; we do not know when we will get there. We have launched a new spark which is things and skills share for Meaford. We are utilizing the Streetbank.com platform for this. Anyone is welcome to join Streetbank.com. Instructions: It is free to become a member and all you need to do to be able to view what your neighbours are sharing is to go to streetbank.com, create an account and share at least one item. Promotional tools are on the page Spread the Word. For example, here is a page you can print out and hand out to your neighbours (add your name and address), here is the poster. As part of the update to the Municipality’s Official Plan, new policies were included to support local residents in efforts towards food sovereignty and the creation of a local food economy. In 2014 the Zoning By-law was updated to implement these policy directions, creating new permissions for Community & Urban Agricultural Uses such as Community Gardens, Urban and Rural Backyard Poultry, Hobby Beekeeping as well as the keeping of Accessory Livestock on Rural Residential lots. A six-month pilot project to study the potential for diversion of plastic waste from Meaford’s landfill was officially launched on Sunday March 10th. With strong support from municipal staff and the active participation of a number of council members, the initiative will involve a group of families and small businesses who will collect plastic film that is currently not picked up in the Blue Box program. 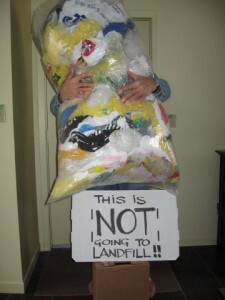 This includes plastics such as: bubble wrap, shopping bags, newspaper sleeves, product packaging, soil and fertilizer bags and cling wrap, which compose an ever-increasing proportion of our landfill, and which are to be found in islands that now measure hundreds of square kilometers, floating in our oceans. The pilot study will allow the municipality to project the possibilities for waste collection and diversion on a larger scale, and will allow time to explore efficiencies such as compaction and baling of the plastic waste for recycling. Switch Energy, ofClinton Ontario, will be collecting the film at no charge, and the waste will be recycled by washing, drying, chopping into powder, and mixing with corn-based resins to create environmentally friendly resin for manufacturing ‘green’ MDF panels and Oriented Strand Board (OSB). These products have typically used toxic urea-formaldehyde resins in their manufacture, and green alternatives are increasingly sought after to contribute to LEED accreditation in new building projects. This initiative has caught the attention of Waste Diversion Ontario, who recently presented Meaford with the award for the highest rate of waste diversion among Ontario municipalities (2011). WDO executives met with Thomas Dean, who helped develop the pilot program, on March 11th, and they will be closely following progress and considering ways to assist directly as the larger scale potential becomes clearer. Greg Brown, one of the project participants, points out that diversion and purposeful recycling of plastic waste is another important step towards a zero-waste ideal, as outlined in the vision of Zero Waste Canada. 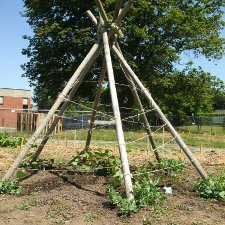 Spring is almost here and for the third year in a row, tenants of the Georgian Bay Secondary School (GBSS) community garden are planning for the new season. The GBSS community garden came into being as a result of a cooperative effort between interested students, the Meaford Golden Town Outreach and Transition Meaford. Individual plots are tended by community members who also donate time and effort to the maintenance of the Meaford Outreach plot. The focus this year will be to establish a communal rhubarb patch, berry bushes, tomato plot, a tree nursery which will eventually be to the benefit of Memorial Park, and the creation of raised garden beds. In keeping with the spirit of the document “Sustainability Meaford, Engagement Summary and Policy Recommendations”, plans are in the making to establish another two community gardens. “I believe that we can create a more resilient, self-sufficient food production and consumption system that does not depend on far-off lands to sustain us and that surely meets the needs of all our community members” says Jaden Calvert. Jaden is an enthusiastic proponent of sustainable living and consumption of locally grown food. He organized last year’s GBSS community garden plant sale, an event where gardeners can buy plants adapted to local conditions with the aim of growing high quality food in an environmentally friendly manner. The sale was successful for all concerned and Jaden will provide quality plants for sale again this year. Anyone interested in learning more about community gardening?